I have approximately 215 students this semester spread out over seven different classes at Hankuk University of Foreign Studies in Seoul. This is my second semester here and I was fairly conservative in my approach in the first semester, using methods that seemed aligned with Korean university practices. I was trepidatious to extend the classroom discussion into a social network of any sort, or to use any tool that might enhance the learning experience outside the classroom. I wanted to stay consistent with university teaching practices (which I wasn’t in any danger of breaking). The semester was successful overall, but I was dissatisfied with certain aspects of my teaching. My trepidation in using outside tools was one such dissatisfaction. I began planning this semester knowing full well that I would be using blogs (for my writing courses) and audio tools (for my language courses). The objective here was to extend the contact time with both the course content and the skills being targeted. My classes meet 2 hours a week, once a week, so time is precious in the classroom itself. I wanted to generate a system that would double the contact time at a minimum (so an additional 2 hours or more). I had used blogs in writing classes before, but not at this current university. Using Audioboo in class was more or less a first for me (although I had used it for informal learning activities). I wanted to keep the requirements for participation at a minimum at the beginning of the semester, focusing more on socializing activities to increase buy-in for tools they had never used before (none of the 215 students had used Audioboo; only a handful had ever had a blog before). So I embed questions/prompts in the presentation slides, which I post to the university LMS before the class so students can follow along on their mobile devices. I have a minimum of two questions per week which require responses (1 minute of audio for Audioboo; a minimum of two paragraphs for the blogs). I also require them to respond to a fellow student for each question as well (these can be shorter). I will eventually give them dedicated peer review partners (two students paired up for the semester to edit/review all their work), teach them to give feedback with target vocabulary (as it is their second language), and turn them loose. So, the average week would have 2 posts and 2 comments per student. That is about 860 discrete bits of learning outputs per week. I wouldn’t dream of doing this without some sort of tool that would allow me to monitor and comment, organize and share information relatively easily. We didn’t have anything in-house (our university LMS was developed by the university itself) that would account for this, so I turned to tools I was already using. I have been using Feedly ever since Google Reader shuffled off this digital coil and have found it satisfactory for the type of reading I do (in the morning, with coffee, reading for purpose, reading to stay up to speed on trends, scheduling tweets and posts via Buffer). 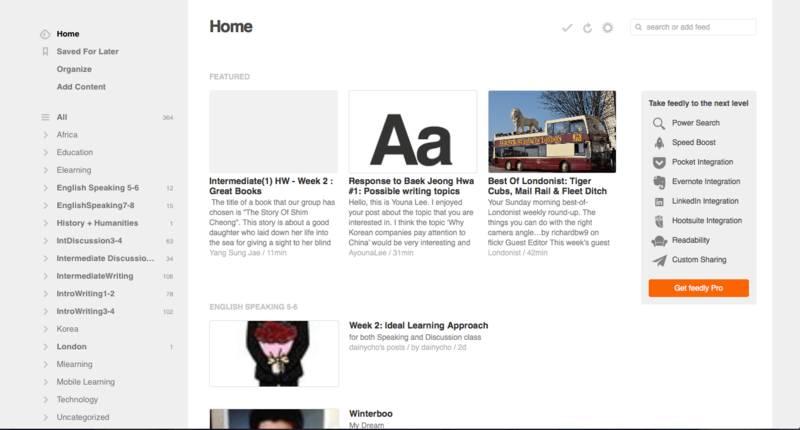 My goal was to bring the RSS feed for each of these channels and each of these students into Feedly, organized by class. Which is what I did. Here is the sequence. Distribute lists of student URLs to class so they can follow and comment as required. Nothing earth-shattering here, but it has worked well for me. It allows me to do a quick check to see if students are submitting, allows me an easy way to comment, share, or tag a post for later use. I would recommend giving each question or prompt a unique title (for example, Week 2: Learning Expectations) which makes it even easier to scan to see who has completed the work and who hasn’t. I try to share three exemplary posts for each week from each class (names excluded, at least at the beginning) and the tag feature in Feedly is an easy way to collect these. All in all, an efficient teaching tool with mobile applications that sync up well across my devices allowing me to check as much as possible on the hour long subway commute every morning. Hello there, Livia. It seems to be working. Each of the RSS feeds is named after the individual student and they are organized by class so I can see exactly who has posted what and how often. It is working rather well, I think, and it gets more out of the class than the normal 2 hours a week. Overall, I am happy with it. Still ironing out some kinks, but I am pleased. Hope all is well, Livia! Hi Michael – Good to hear it’s working – the point I suppose is not that you can make people work harder (crack that whip) but that they learn better. Do you have comparisons on results with your first term’s learners, or was it a different course? All is well here although I’m not doing anything academic at the moment – working on the house and focusing on getting to grips with my new job. Congratulations on the new job (and I am sure getting the house in order is a full time job in and of itself). Unfortunately, teaching different classes this semester so hard to have a direct comparison. As you said, it isn’t about working harder, but just smarter. Maximizing the time we have to learn, in and out of the classroom. Crossing my fingers! Good question, Livia. I don’t administer the end of term feedback (as it used for our renewal) but I can see if I can insert a question in there. Good idea.